Eager for a glimpse of Viking Sea — the second ocean ship from river giant Viking? USA TODAY this week got early access to the 930-passenger vessel ahead its christening next month in Greenwich, England. Viking Sea is less than a third the size of the latest megaships from the likes of Royal Caribbean and Norwegian Cruise Line, and it was designed to mix on-board elegance with a focus on destinations that executives say has been lost across much of the cruise industry in recent years. 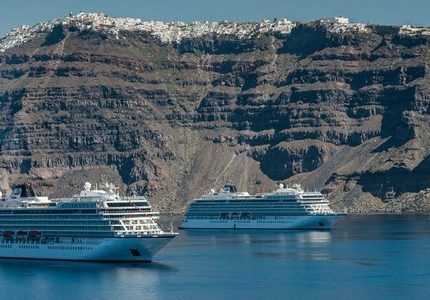 Viking’s move into ocean cruising comes as the company increasingly dominates the world of river cruising. The line last month christened seven new river ships, which join more than 20 other new vessels added over the last two years. The company now has 56 river ships operating on European rivers. The Viking Sea has a stylish, modern design, and cabins are large for a cruise ship, with the smallest of five cabin categories having 270 square feet of space. In addition, every cabin has a balcony. Fourteen two-room suites on the ship range from 757 to 1,448 square feet and offer sweeping views from wrap-around private balconies. The Viking Sea’s inaugural season features eight- to 50-day sailings around the Baltic and Mediterranean starting at $2,499 per person. To view the extensive slide show, click here.